Last week’s episode of Survivor: Caramoan – Fans vs. 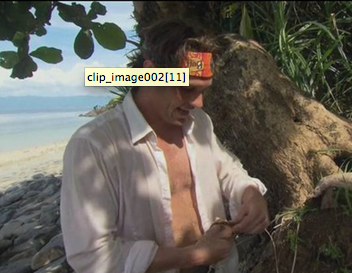 Favorites 2 Legit 2 Quit began with another temper tantrum from Brandon upon returning from Tribal Council. This week, not to be outdone, Brandon’s counterpart on the Fans side, Shamar, sounded off loudly after the vote. We talked in our last post about our uneasiness concerning these two bellicose, volatile players, that their unhinged – and often selfish – behavior would unfairly take center stage, and this happened once again in the latest episode, right off the bat. Here’s how it sounded at Goata camp. Last week we talked about our disappointment in the casting of Survivor: Caramoan – Fans vs. Favorites 2 Legit to Quit, as the producers seemed to have emphasized loud, dramatic, troublemakers over solid, interesting, sane players. We drew attention back to Survivor: Palau, which featured none of those emotionally unstable, wildcard types and, yet, proved to be perhaps the show’s finest season. Why? Because this show is so good, because it puts ordinary people in such incredible, extraordinary situations, that you don’t need to manufacture drama. If you just let the game play out, let the interpersonal dynamics take over, then you have magical theater. The kind that we actually do get at the end of last episode of Caramoan. However, while the denouement was a pleasant surprise, what the episode mostly did was grant attention to the two most volatile personalities out there, Brandon and Shamar, validating their petulant and borderline-psychotic behavior. Russell Hantz, for the record, was a fascinating, nuanced character (at least at first). 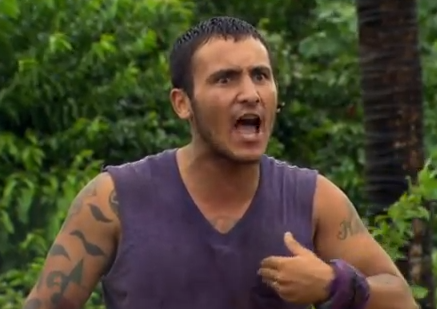 Brandon Hantz, on the other hand, is all the worst parts of his uncle, all id, no strategy. He may have his uncle’s blood, but that doesn’t mean he got his gift for the game, or even his flair for havoc. Actually , Brandon that’s literally how genetics works. DNA is passed down through generations. Although, what you might be feeling is those leeches sucking out your blood. You should probably get a medic to look at you. For the last few seasons we’ve become increasingly irritated by the presence of God, or, rather, some players’ insistence that he (or she!) has some influence on the game of Survivor, from Matt justifying his repeated exile to Redemption Island as part of Jesus’s plan to Brandon Hantz invoking the will of the Lord in his quest to purge Mikayla from the game (and maybe the Earth) because of her fictional harlot tendencies. For one season we can deal with these bible thumpers, but as it became a consistent aspect of the game, it became grating, obnoxious even. Sure, God may love Survivor, but as a true fan he would never get involved. When it comes to Survivor, God is agnostic, and if he had a dog in the fight, it wouldn’t be someone from the God Squad, it would be a rough and tumble champion, like Sophie or Lt. Tom Westman. But even if God had a rooting interest, we were sure that he (or she!) had no impact on the game, just like he has nothing to do with Tim Tebow (unless sending him to the Jets is God’s idea of a holy hilarious joke). However, after this week’s Survivor: One World! we’ve changed our mind. Because if that wasn’t divine intervention, if that wasn’t an instance of God reigning down vengeance from above, we don’t know what is.